Fiona joined the Medical Negligence team as a paralegal in 2008 and became a trainee with the firm in 2014, qualifying as a solicitor in January 2016. She was promoted to Associate in April 2019. Fiona’s caseload includes a range of injury types, including sepsis, missed fractures, extravasation injuries, fatal claims and inguinal hernia surgery resulting in permanent nerve damage. She was formerly a registered nurse with broad experience in medicine, surgery and gynaecology, as well as specialist training in oncology. 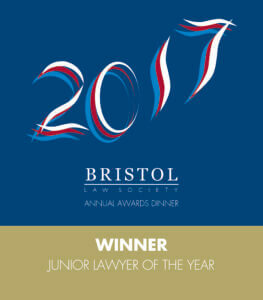 Fiona was named Bristol Law Society’s Junior Lawyer of the Year 2017. Fiona, you came to our rescue and took our case on when others had turned it away. You did us proud and I am eternally grateful for your support in getting justice for my son.